The National Speleological Foundation (NSF) has agreed to fund CaveSim's return transportation to Colorado from the 2012 NSS Convention, MayaCon. Now all we need is help getting to convention is the first place. The NSF was generous enough to fund half of this trip, bringing CaveSim to thousands of convention goers, community members, and teachers across the county. Can you or your grotto help CaveSim with the rest? Contact us. Both The Denver Post and The Colorado Springs Gazette newspapers dig CaveSim too! Check out their fun, well-written articles: Gazette article online (full article), Denver Post article online (partial article), Denver Post article pdf (partial article). Cavers from CaveSim, Southern Colorado Mountain Grotto, and Catamount Institute gathered Sunday to provide special cave exploration tours at Cave of the Winds. Highlights included vertical (SRT) demonstrations, hands-on cave survey work, bat surveys, and speleogenesis classes. Everyone did a great job today and yesterday; special thanks to SoCoMoGro members Floyd, Patricia, Dan, LP, Mike, Donna, and Jonny. Dave had a great time teaching speleology and speleogenesis (in the pictures below, Dave gets to play with acid). Dave teaches about corrosion residue and demonstrates acid on limestone. Photos by Emerson Killion. CaveSim has now had over 1000 visitors in one year and eight months! Thank you to all of our visitors. We had a record number of visitors crawl through CaveSim today, including some repeat customers from the Colorado Springs festival last year who came to check out all that we've added. People can't get enough of CaveSim! Kids learn about caves while waiting in line, and excitedly peer into CaveSim. Photos by Bruce Hutchison. If you have any photos of CaveSim that you're willing to have published in the Convention issue of the NSS News, please send them to jacksondmit@cavesim.com, along with your name and the names of anyone in the pictures that you can identify. Deadline: September 15, 2011. Thanks! ... along with some really funny captions! Thanks to Peter and Ann Bosted, we now have great 3D photos of CaveSim on our Photo Gallery page. Below is a picture of Ann inspecting a big stal in CaveSim. In addition, we heard some great comments from participants during the week. Thanks to everyone who gave us feedback. Check out some of the comments on our Testimonials page. Also, we have some final numbers from the Convention. We had 327 visits to CaveSim during the week with an average damage of 8.9 and an average time of 2:49.5. Below is a plot of the data that we recorded (click to enlarge). Over 200 people have tried CaveSim in the first three days of the Convention. Thanks to everyone who stopped by, including Peter and Ann Bosted who took 3D photos of the CaveSim formations. Some CaveSim formations are based on Peter and Ann's pictures. Check out the picture of Peter and Ann photographing CaveSim on our Photo Gallery page. We hope to post their 3D CaveSim pictures soon. They are world-renowned for their pioneering work in 3D cave photography, and they have an awesome website. Our best youth score so far is 0 damage in 33 seconds, and our best adult score is 0 damage in 1 minute, 45 seconds. Speleo Olympics awards for CaveSim will be announced after the other Speleo Olympic events, which are on Thursday. There's still time to compete - stop by the gym at the Glenwood Springs High School. The June issue of the NSS News features an article about the upcoming 2011 NSS Convention, including a writeup about CaveSim, which will be part of the Speleo-Olympics. Here at CaveSim, we turn discarded electronics into sensors for amazing caves. We also use discarded latex paint and we reduce, reuse, and recycle wherever we can. We're always interested in learning new techniques for being nice to the planet as we build caves, so we joined the Pikes Peak Sustainable Business Network (PPSBN, part of the Catamount Institute). Look for us at PPSBN events! We've added more photos to the photo gallery page, including pictures of kids and rescuers crawling through. 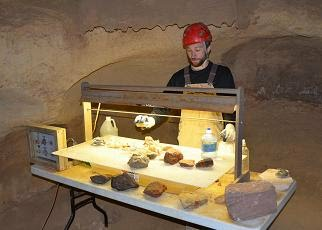 Tracy's excellent article about CaveSim was published in the Pikes Peak Bulletin. We never rest! Follow us. We've added a new entrance to CaveSim. You can see it in the photo gallery. Built to look like real rock, the entrance communicates with the CaveSim computer to automatically start recording when you crawl through, and automatically stop recording once you're completely out. It even talks to you when you start and finish. CaveSim will be bringing The Cave to Glenwood Springs, Colorado for the 2011 National Speleological Society Convention, July 18-22. We'll have several new sections, more challenging than ever, along with a bunch of new formations. We're excited that CaveSim will be one of the obstacle courses in the Speleo Olympics for the first time. We'll be posting more detail soon - visit this page again soon for updates. The convention website is http://nss2011.com/.